(L to R) Charlie, Nobuko, and Chris rehearsing in the kitchen of Folk City before a performance, New York City, ca. 1971. Album cover designed by Arlan Huang and Karl Matsuda/Basement Workshop. Cover of A Grain of Sand album liner notes with a photograph by Bob Hsiang of a 1972 anti-war demonstration at Cornell University. Artist bios from A Grain of Sand album liner notes with a photograph by Bob Hsiang. Nobuko Miyamoto participating in Republic of New Africa demonstration at the United Nations, New York, ca. 1972. Nobuko Miyamoto and her two grandchildren, Asiyah and Muhammad Ayubbi, at Senshin Buddhist Temple obon celebration, ca 2007. 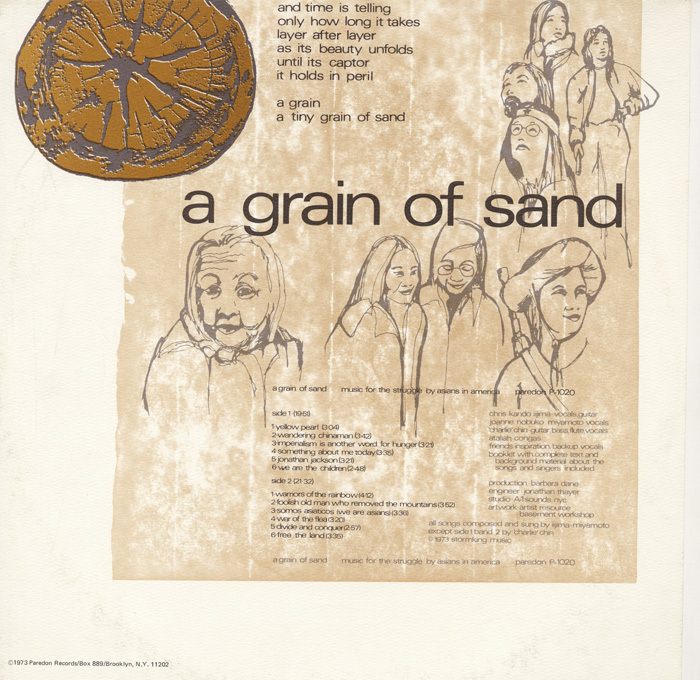 In 1973, three young activists in New York City recorded A Grain of Sand: Music for the Struggle by Asians in America. Singing of their direct lineage to immigrant workers as well as their affinity with freedom fighters everywhere, Chris Kando Iijima, Nobuko JoAnne Miyamoto, and William “Charlie” Chin recorded the experiences of the first generation to identify with the term and concept Asian American—a pan-ethnic association formulated upon a shared history of discrimination. They sought a connection to their cultural heritage; to claim their historical presence in the United States; to resist their marginalization; and to mobilize solidarity across class, ethnic, racial, and national differences. Music provided a powerful means for expressing their aspiration to reshape a society reeling from a prolonged war, ongoing struggles against racial inequity, and revelations of the Watergate cover-up. As writer and activist Phil Tajitsu Nash would state many decades later, A Grain of Sand was “more than just grooves on a piece of vinyl,” it was “the soundtrack for the political and personal awareness taking place in their lives.” Equal parts political manifesto, collaborative art project, and organizing tool, it is widely recognized as the first album of Asian American music. A Grain of Sand was produced by Paredon Records. Over the course of 15 years, Paredon founders Irwin Silber and Barbara Dane amassed a catalog of 50 titles reflecting their commitment to the music of peace and social justice movements. In 1991, to ensure its ongoing accessibility, Silber and Dane donated the Paredon catalog to the Ralph Rinzler Folklife Archives and Collections at the Smithsonian Center for Folklife and Cultural Heritage, through which these recordings and their original liner notes remain available to the public. Intending to take their music on the road, they kept their instrumentation simple—two guitars and three voices. For the album and in some performances, they were backed by conga and bass, and other instruments such as the di zi, a Chinese transverse flute that Charlie played. Chris, Nobuko, and Charlie, who were in their twenties and thirties in the early 1970s, arrived at their collaboration via routes that reflect the legacies of migration and exclusion. Nobuko JoAnne Miyamoto (b. 1939). Nobuko’s mother was born in the United States, the daughter of Japanese immigrants; her father was the son of a Japanese immigrant father and a White Mormon mother from Idaho. The family was living in Los Angeles when World War II broke out and all people of Japanese ancestry on the West Coast were forcibly removed from their communities. To get his family out of the Santa Anita racetrack where they were initially confined, Nobuko’s father volunteered to harvest sugar beets in Montana. From there the family moved to Idaho and then to Utah before they were allowed to return to Los Angeles after the war. Despite this instability, Nobuko was encouraged by both parents in her study of music and dance. By the 1960s, she had been a scholarship student at the American School of Dance in Hollywood; performed with Alicia Alonso’s ballet company; and performed in the original Broadway production of Flower Drum Song, as well as in the film adaptation of West Side Story, where she was cast as one of Maria’s Puerto Rican dress-shop companions. She had also discovered the limitations of being an Asian in the mainstream entertainment industry. In 1968, she helped Italian filmmaker Antonello Branca to document the Black Panther Party for his film Seize the Time. Through this project, she met Yuri Kochiyama, a Harlem community activist and friend of the late Malcolm X, who subsequently introduced Nobuko to civil rights organizing in the local Asian and African American communities. Chris Kando Iijima (1948–2005). Both of Chris’s parents, Americans of Japanese ancestry, were originally from California but raised their family in New York City, where they resettled after their World War II incarceration. Their example and consciousness significantly contributed to A Grain of Sand. Chris’s father was a musician and choirmaster, who took his children to the 1963 March on Washington. His mother—inspired by the educational and cultural activities integral to the Black Power movement—co-founded the organization Asian Americans for Action (Triple A) in 1969 to instill the same kind of pride in local Asian American youth. Chris attended the High School of Music and Art in Harlem, where he studied French horn, though he also played guitar. Chris and Nobuko met in Triple A; and they wrote their first song and performed together in 1969 at a conference of the Japanese American Citizens League, where they joined other young people in urging the organization to oppose the war in Vietnam. Nobuko recalls, “We sang a song that was the collective expression of our Asian brothers and sisters to stop the killing of people who looked like us. The electricity of that moment, the realization that, until then, we had never heard songs about us, set the course of my journey.” When they returned to New York, Chris and Nobuko wrote more songs and began to perform locally and in California. A year later they met Charlie Chin. Coming of age during the civil rights and anti-war movements, the children and grandchildren of Asian immigrants unleashed a whirlwind of grassroots activism beginning in the late 1960s. Around the country, they protested the war. They demanded ethnic studies curricula. They organized against urban renewal projects that displaced the residents of old Chinatowns and Japantowns. They formed literary workshops, art collectives, and social service centers. A Grain of Sand was a direct extension of Chris, Nobuko, and Charlie’s collaboration in the Asian American Movement. Chris, Nobuko, and Charlie’s association with activists in other communities was reflected in their music. For example, “Somos Asiaticos” was inspired by their involvement with squatters’ organizations Operation Move In and El Comité. These activists opened a coffee shop on Manhattan’s Upper West Side, the Dot, which was regularly visited by singers, performers, and poets from Cuba, Chile, Peru, Puerto Rico, and the Dominican Republic. The Asian Americans who had taken over a storefront for a drop-in center down the street also congregated here. Nobuko recalled, “We were all there—artists and poets—listening to and influencing each other. We had a whole set, five songs, that we did in Spanish. One year, I think it was 1973–1974, we did more gigs for Latino groups than for Asian groups.” In fact, their first recording was done for a Puerto Rican company, Discos Coqui. Invited by two Puerto Rican Movement singers, Pepe y Flora, they recorded “Venceremos” and “Somos Asiaticos,” which were released as a 45 disc in Puerto Rico. Later, they were invited to perform at Madison Square Garden for Puerto Rican Liberation Day. “Free the Land,” another song on A Grain of Sand, was written by Chris for the Republic of New Africa. This organization, established by a group of Malcolm X’s associates after his 1965 assassination, was the first group to call for slavery reparations—in particular in the form of an all-Black homeland in the southern states of Mississippi, Alabama, Georgia, Louisiana, and South Carolina. Atallah Muhammad Ayubbi and Dr. Mutulu Shakur, both Republic of New Africa members, performed on A Grain of Sand. Atallah worked in the Black and Puerto Rican communities in the Bronx where he grew up. He was also a conguero and sometimes accompanied the group in live performances. Dr. Mutulu Shakur, who is the godfather of Nobuko and Atallah’s son, provided background vocals on the album. He often played the album at home, and his stepson, the late rapper Tupac Shakur, grew up listening and singing along to it. The intensity of purpose and activity during this period succeed in reshaping academic, cultural, and political institutions. It also gave rise to ideological conflicts and violence that sometimes destabilized organizations and efforts. For instance, Basement Workshop was shaken internally by the accusations and criticisms of members of the Communist Workers Party. And several months after A Grain of Sand was recorded, Atallah was killed in an ambush at a Brooklyn mosque. By late 1973 when A Grain of Sand was released, Chris, Nobuko, and Charlie were beginning to hone their sense of purpose in ways that drew them in different directions. And the album marks, in effect, one of the group’s final collective efforts, though each in their own way continued the work they had started together. Nobuko returned to southern California. In 1978, she established the organization Great Leap, Inc., through which she initiates multicultural community performing arts collaborations in Los Angeles, as well as nationally and internationally. She continues to perform, lecture, and provide workshops based on her new music as well as on reinterpretations of the songs from A Grain of Sand. In recent years her residencies and special projects have focused on facilitating dialog across spiritual differences and on environmental issues. Active in the Senshin Buddhist Temple, she has composed music and dances that are now a regular part of the annual Buddhist observance of obon (Festival of Lanterns) in temples from California’s Central Valley to San Diego and nationally. Chris directed his energies to New York’s Upper West Side, where he had grown up. After 10 years of classroom teaching at Manhattan Country School, he studied and practiced law, and later became a professor in Hawai`i, where he fought for Native Hawaiian rights and mentored a generation of social justice–minded law students. He passed away in 2005 at the age of 57. "Jonathan Jackson" from Tadashi Nakamura on Vimeo. This trailer for Tadashi Nakamura’s 2009 documentary A Song for Ourselves: A Personal Journey into the Life and Music of Asian American Movement Troubadour Chris Iijima features Nobuko Miyamoto discussing the composition of the song “Jonathan Jackson.” Courtesy of Tadashi Nakamura. A SONG FOR OURSELVES 2.28.09 Premiere Trailer from Tadashi Nakamura on Vimeo. Pepe y Flora were musicians involved in the Puerto Rican liberation movement. They recorded the album Tengo Puerto Rico en Mi Corazón for Paredon Records in 1971. When A Grain of Sand was released in late 1973, there were three taiko (Japanese drum) groups in the United States, all in California. Within this same context of civil rights and ethnic consciousness, these groups used a Japanese musical form to assert a powerful and loud identity that challenged mainstream ethnic and gender stereotypes associated with Asians. Chris Iijima recalls, “The first time I saw a taiko drum and even though I was like this kid from New York City, who had never seen a taiko drum, suddenly I owned it. It was mine.” Soh Daiko, the first group on the East Coast, was founded in 1979 at the New York Buddhist Church on the Upper West Side near where Chris had grown up. Its members were activists and artists involved in the same local movements as Chris, Nobuko, and Charlie.